Report: Students don’t know much about US history: U.S. students don’t know much about American history, according to results of a national test released Tuesday. Just 13 percent of high school seniors who took the 2010 National Assessment of Educational Progress — called the Nation’s Report Card — showed solid academic performance in American history. The two other grade levels tested didn’t perform much better, which just 22 percent of fourth-grade students and 18 percent of eighth-graders scoring proficient or better. U.S. Students Remain Poor at History, Tests Show: American students are less proficient in their nation’s history than in any other subject, according to results of a nationwide test released on Tuesday, with most fourth graders unable to say why Abraham Lincoln was an important figure and few high school seniors able to identify China as the North Korean ally that fought American troops during the Korean War. Less than a quarter of students proficient in history: U.S. students are making some gains in their knowledge of American History, but less than a quarter are scoring at or above the proficient level, according to a report released on Tuesday. The results of the 2010 National Assessment of Educational Progress showed just 20 percent of fourth graders, 17 percent of eighth graders, and 12 percent of twelfth graders were performing at or above the proficient level. The study defines the proficient level as representing solid academic performance and competency. 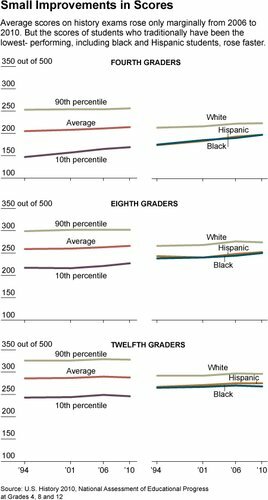 Even so, for students in the fourth and eighth grades, average scores were the highest since 1994, when the study was first conducted. History-Test Scores Show Scant Progress: Fewer than a quarter of American 12th-graders knew China was North Korea’s ally during the Korean War, and only 35% of fourth-graders knew the purpose of the Declaration of Independence, according to national history-test scores released Tuesday. The results from the National Assessment of Educational Progress revealed that U.S. schoolchildren have made little progress since 2006 in their understanding of key historical themes, including the basic principles of democracy and America’s role in the world. Only 20% of U.S. fourth-graders and 17% of eighth-graders who took the 2010 history exam were “proficient” or “advanced,” unchanged since the test was last administered in 2006. Proficient means students have a solid understanding of the material. Federal report shows history scores rising slowly: Most fourth-graders who took a national U.S. history test last year were likely to be stumped if asked to identify a picture of Abraham Lincoln and give two reasons why he was important. A majority of eighth- graders would have had trouble articulating an advantage American forces had over the British during the Revolutionary War. And most 12th-graders were likely to miss if asked why the United States entered World War I. Those findings were included Tuesday in the first federal readout on history achievement in four years.